← A special issue of Medical Anthropology on "Medical Travel"
I’m passing along the announcement of a new international journal on the anthropology of health: Anthropologie & Santé. Anthropologie & Santé is a semi-annual scientific journal, created as an initiative by l’Association Amades. Its primary objective is to speak to various tendencies of research/researchers in the areas of the anthropology of health and disease; critical practices of care; health systems and institutions; clinical anthropology; political anthropology of health; applied medical anthropology, etc. 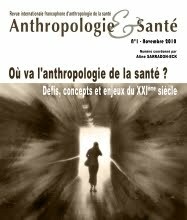 Anthropologie & Santé is the first French-language journal primarily focused upon the anthropology of health. The journal publishes articles based on empirical research, methodological and epistemological reflections, theoretical elaborations, and essay-length critical reviews. Anthropologie & Santé welcomes contributions from younger scholars in France, as well as scholars outside of France. Le premier numéro d’Anthropologie & Santé rend compte de quelques-unes des lignes de force du débat engagé lors des Assises de l’Anthropologie de la Santé organisées par Amades (Toulouse, 18 septembre 2009). Ces assises ont porté sur les transformations et mutations contemporaines des objets, des pratiques méthodologiques et des conditions d’exercice de la recherche en anthropologie de la santé. Les contributeurs de ce numéro interrogent, chacun à leur manière, les possibilités d’adaptation de l’anthropologie de la santé aux mondes contemporains et sa capacité à se réformer sans perdre de vue les “fondamentaux” de la discipline. Quel humanisme pour notre âge bio-technologique ? L’anthropologie, horizon nécessaire de l’anthropologie médicale. Which humanism in our bio-technological age ? Anthropology as a necessary horizon for medical anthropology. Meyers T. A New Journal, Anthropologie & Santé. Somatosphere. 2010. Available at: http://somatosphere.net/2010/new-journal-new-section.html/. Accessed April 25, 2019. Meyers, Todd. 2010. A New Journal, Anthropologie & Santé. Somatosphere. http://somatosphere.net/2010/new-journal-new-section.html/ (accessed April 25, 2019).